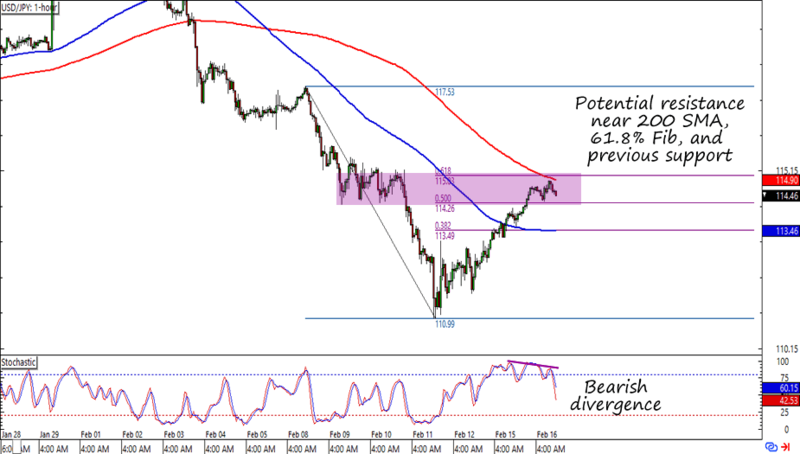 Forex Trade: Will USD/JPY’s Downtrend Continue? Found a potential forex trade for trend warriors out there! This time I’m looking at a nice Fib retracement on USD/JPY’s 1-hour chart. As you can see on the chart below, USD/JPY is having a hard time breaking above the 115.00 area. And why not? The major psychological handle is right around a previous support zone as well as a 61.8% Fib retracement and 200 SMA resistance on the 1-hour chart. The cherry on top of this sweet setup is a bearish divergence slowly making itself known. Fundamentally I’m banking on the markets to keep on ignoring the BOJ’s attempts at jawboning. The central bank might have gotten a reprieve for the past couple of days thanks to a bit of risk-taking and Chinese traders going back from their week-long vacation, but I don’t think the overall picture for most of the major economies has changed. With so many major central banks still scrambling to stimulate their economies, I think it’s not impossible to see another leg higher for the low-yielding yen across the board. This is why I risked 0.25% on a short trade. I placed my entry order at 114.50 (update: got triggered!) and put my stop loss a full weekly ATR away at 117.10. My initial profit target is around the previous lows (111.50 area) but I might move it depending on how strong the downtrend goes. Short 0.25% of my account at 114.50 with my SL at 117.10 and initial profit targets at 111.50. I gotta be careful in shorting USD/JPY though. After all, the Fed is still one of the few central banks that are even considering rate hikes. The FOMC minutes could also trip this trade up, especially if it drops a few hints that the Fed members in general aren’t as opposed to more rate hikes as some of their recent speeches suggest. Lastly, risk appetite could simply extend throughout the week and hit my stop loss levels. In any case, I’ll definitely keep close tabs on this pair in case I need to make adjustments. What do you think? Will the yen go back to its uptrend against the dollar? Do you have any trades on the dollar or yen for yourself? Any advice would be much appreciated!